Hard to believe, but researchers estimate that 80 percent of adults in the United States have gum disease. Sadly, the majority of these people are unaware that they have this chronic bacterial infection. With those kinds of statistic, however, it’s important to know the signs for each stage of gum disease and how it can be treated. Read on to learn more from a periodontist in Worcester. Gingivitisis the first stage. Inadequate brushing and flossing allows plaque to build up along the gum line. Bacteria hiding in plaque release toxins that can irritate gum tissue and cause inflammation. Consequently, you may notice that your gums bleed during oral hygiene. Don’t make the mistake of brushing and flossing less, because you think this will stop the bleeding. Just the opposite is true. Better oral hygiene removes plaque from between your teeth and along the gum line. Periodontitisis the second stage that happens if plaque is not removed. With periodontitis, the supporting bone and fibers that keep your teeth in place are damaged. Gum tissue may begin to pull away from your teeth and form pockets where even more bacterial plaque can accumulate. During this stage, you may notice that your teeth look longer because of gum recession. Advanced periodontitisis the final stage of gum disease. Here, supporting bone and fibers are actually destroyed by bacterial attack. As a result, you teeth may become loose and shift, affecting your bite. Without treatment, teeth may need extraction. 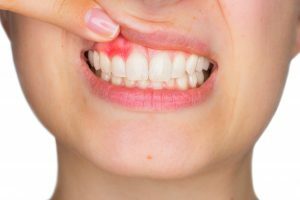 The signs of advanced periodontitis include changes in the way your teeth come together when you bite; pus between your teeth and gums; and persistent bad breath or a sour taste in your mouth. How Are the Stages of Gum Disease Treated? A periodontist in Worcester will be able to make the correct treatment recommendation. But generally speaking, gingivitis can be reversed with a more stringent oral hygiene routine at home. Brush and floss after every meal to prevent plaque build up. For periodontitis, a professional cleaning called scaling and root planing is needed to remove plaque that hardened and becomes tartar. First, teeth are scaled above and below the gum line to eliminate tartar. Then, root planing helps smooth your teeth roots so plaque is less likely to deposit there. Advanced periodontitis requires a consultation with a periodontist in order to know the appropriate course of treatment. Depending on the severity of your case, some teeth may need to be removed before other forms of therapy can begin. If you see any signs of gum disease, contact a periodontist in Worcester today. Dr. Handsman and Dr. Jenny are periodontists in Worcester. Both are trained and skilled in the diagnosis and treatment of periodontal disease through non-surgical and surgical treatments such as dental implants. Call to schedule an appointment today.